Notice is hereby given that the Dayton Municipal Election will be held Wednesday, April 17, 2019, between the hours of 8 a.m. and 8 p.m. Any registered voter of the City of Dayton, excluding Property Rights voters and voters who voted by absentee ballot, will vote at the Rhea County Welcome Center, 107 Main St., Dayton. Property Rights voters or others wishing to vote by absentee ballot may request an absentee ballot by contacting the election commission no later than Wednesday, April 10, 2019. Absentee ballots must be received by mail no later than 8 p.m. on April 17, 2019, to be eligible to be counted. 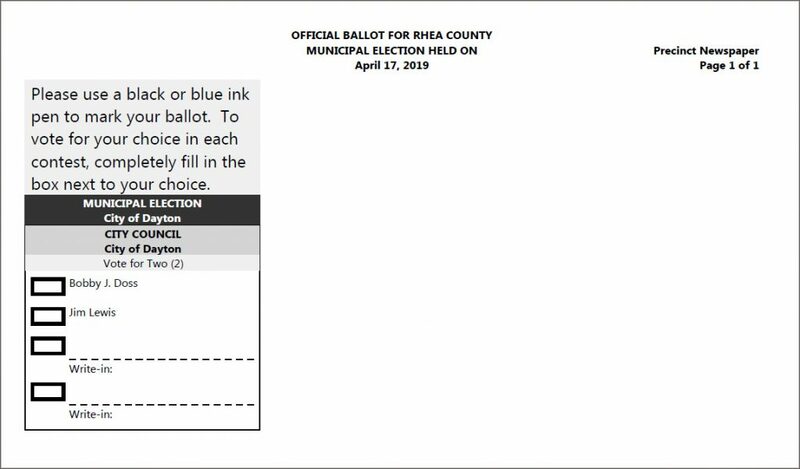 The Absentee Counting Board will convene at 4 p.m., Wednesday, April 17, 2019, at the Rhea County Election Commission office, 125 Court Street, Suite 1, Dayton, TN 37321. ALL VOTERS WHO VOTE IN PERSON MUST PRESENT A FEDERAL OR TENNESSEE-ISSUED PHOTO ID. The ID must contain the voter’s name and photograph. For information about exemptions or acceptable photo IDs, please contact our office.